My health awareness and health education program is established in dedication to my mother Everee, grandma Annie Kate, grandpa Poppie, father Lonia and brother Savoda and, to all citizens living in underserved urban communities within N.Y.C. Their lives are adversely affected by the prevalence of hypertension, heart disease, obesity, and diabetes, which contributes to the high morbidity and mortality rate in these communities. As a grassroots Brooklynite; born in Brooklyn and raised in Bed-Stuy projects. As a R.N. and an Adult NP my goal is to “give back” by influencing change towards a healthier life-style in the urban communities through health education. This health education program is affordable and, is taught using simple medical terminology, in a non-judgemental, relaxed environment for the layperson. This program is highly recommended for emotional eaters and, for adults who have medical histories that include high blood pressure, elevated cholesterol levels, elevated blood sugars and obesity. Evette Simmons is an Adult Nurse Practitioner. 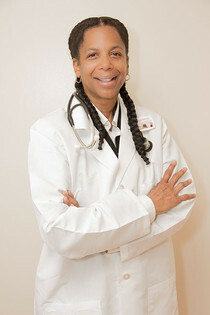 In 1975 Ms. Simmons attended City College School Of Nursing and, obtained her Bachelor Of Science Degree in Nursing and R.N.liscense in 1981.
diverse communities of Brooklyn, New York; she worked as a full-time visiting nurse for the Visitng Nurse Service of Brooklyn and Visiting Nurse Association. Ms. Simmons also worked as a homecare supervisor for visiting nurses at Metropolitan Jewish Geriatric Center Of Brooklyn. In 2003, Ms. Simmons completed the Adult Nurse Practitioner Program at Long Island University Of New York, recieving a Masters Of Science Degree in Nursing, specializing in adult health. Ms. Simmons is currently working in a medical clinic for 25 years. Upon completion of this health education program, the layperson will verbalize increase knowledge of risk factors, causes, and prevention of hypertension, heart disease, obesity, and diabetes. The layperson will also verbalize increased knowledge of healthy life style changes that will result in progressive weight loss. EVETTE SIMMONS R.N., A.N.P., B.S.N., M.S.N.